The effective development of brand positioning for any brand will aid in getting your desired message across and making an impression that lasts. Positioning is the way in which you want the consumer to think about your business (products and services) relative to competing brands. It is the most basic of all strategic statements, provides the blueprint for the marketing and development of the brand, and focuses the efforts of all those involved in brand activities. Your brand will be in good company. We’ve used our one-day proprietary approach to successfully position hundreds of well-known brands for a diverse group of companies, from Fortune 500’s to start-ups and turn-arounds. Our positioning work includes international, national, regional and local brands across many industries. We will quickly and affordably help you to position your brand to effectively compete in today’s competitive marketplace. 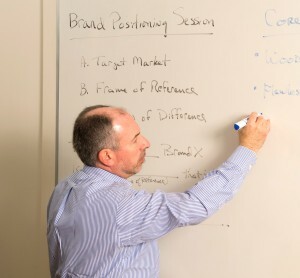 Where we can assist you is by starting with our proprietary one-day positioning methodology, led by Warren Ellish, and working directly with you and members of your team to clearly state and communicate the core elements of a successful positioning for your brand. Point(s) of difference (the specific consumer benefit that is preemptive/ownable/defendable which you want consumers to associate most readily with your products/services).